Crime prevention incidents may be tied into Federal and State grants. According to the Racine County Sheriff’s office and Racine County Corporation Counsel, no criteria exists of what a crime prevention incident is. There were 20,233 reported CPIR’s by Racine County sheriff deputies in 2013 without any criteria of what constitutes a Crime Prevention incident. During our 6 month long investigation, we interviewed numerous law enforcement personnel. and of course the ever proverbial pursuit of DONUTS. 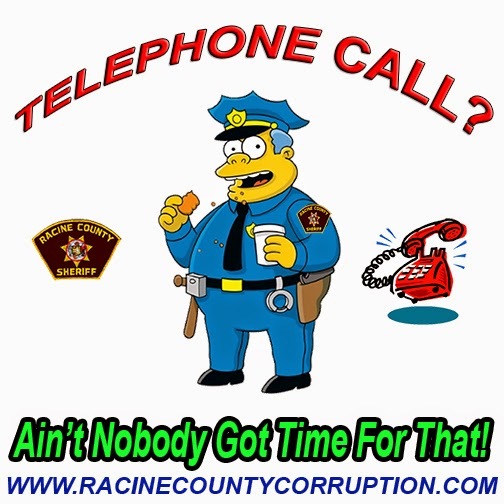 The Racine County sheriff's office may not have time to respond to your calls for assistance, but they sure have enough time to produce and create false and misleading incidents to make them look busy. Sheriff Schmaling and Deputy Sheriff Hanrahan may have some explaining to do in the near future. and how skewed Edward Flynn Milwaukee style statistics are being used by the Racine County Sheriff's Office . Sheriff Schmaling His badge ? Day Two: Duty or Doodie? As a public servant, Sheriff Schmaling's leadership leaves much to be desired. We are not saying he is a bad cop, but we are not saying he is a good cop either. Effective leadership requires the ability to properly place your organization in a position to embrace changes as they take place. In January of 2013, it took 8 days for the sheriff department to return numerous phone calls made requesting an investigator to contact me. After 7 days of no response, I contacted the Racine County District Attorney's Office for guidance . The next day I received a call from a detective from the Sheriff's office. During these 8 days of no contact by the Racine County Sheriff Department, the whereabouts of stolen property I was aware of was moved and the unknown rightful owner was deprived of the opportunity to recover the stolen goods. The responding detective apologized about the 8 day delay of contacting me and stated a perfect storm had occurred at the sheriff's department. The so called "perfect storm" was the retiring of numerous Sheriff Department personnel, exposing a large void in the quality of law enforcement in Racine County. On February 1st. of 2013, I emailed Sheriff Schmaling and Deputy Sheriff John Hanrahan requesting a meeting to discuss the sheriff's office failures to the community and their lapse of management skills. Neither had the courage or decency to respond to my request. So I did what I do well, I exposed their incompetence on Racine County Corruption for all to view. I also took to the streets. Perhaps you recognize the sign I used in front of the Racine County Law Enforcement Center last year. Over a year later, neither Sheriff Schmaling or Deputy Sheriff John Hanrahan embrace community policing. Both continue to fail to respond to concerned citizens who wish to make their department more responsive to the public. As public officials, Sheriff Chris Schmaling and Deputy Sheriff John Hanrahan continue to hide behind the protection of Racine County Corporation Counsel. The most basic of open records request continue to be deflected. What do these incidents really mean? How are these numbers being used? Public servants or public serpents? CPIR’s and Police Science ? One has to wonder what Sheriff Chris Schmaling and Deputy Sheriff John Hanrahan has to hide when a simple and benign open records request is answered by Racine County Corporation Counsel. In the year 2013, there were 20,233 Crime Prevention Incident Reports filed by Racine County sheriff deputies. Interesting fact is the Racine County Sheriff office has no definitions or criteria of what Crime Prevention Incidents are, (herein referred to as CPIR’s)………. a strange paradox indeed. How can a law enforcement agency measure the usefulness of crime prevention incidents when there are no measurable guidelines to measure against? Police Science is a mixed hodgepodge of physical science and social meddling. The physical sciences are criminology, forensic science, psychology, jurisprudence, community policing and criminal justice. CPIR’s do not apply to any of the above physical police sciences, therefore, CPIR’s must fall into the category of meddling. Inquiring minds wonder what CPIR’s are really for. We have an idea, do you? A story about crime prevention incident reports during 2013, all 20,233 of them. During the last 5 months we have been investigating the Racine County Sheriff’s Office methods of classifying reports. While investigating, we came across a classification called “crime prevention incident reports”. Intrigued by the classification, we thought that Chris Schmaling and John Hanrahan had finally embraced community policing, so we focused our attention on Crime Prevention Incident Reports (herein referred to as CPIR) and began making inquiries into CPIR’s. During the month of November, 2013, we began our inquiries at the patrol level. Several patrol officers we interviewed had no idea what we were inquiring about, other patrolman spoke only vaguely of the reports. Others acknowledged the existence of such reports but would not further elaborate. 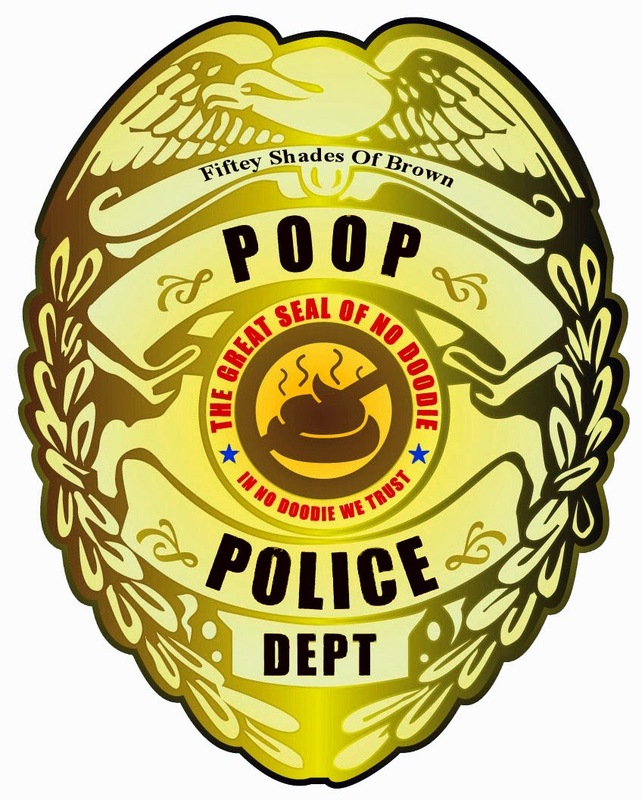 A few patrolmen spoke off record, indicating they had used the classification when stopping for coffee, using the bathroom, or sitting doing reports, justifying the CPIR by the fact their presence at a location deterred crime. We continued to inquire, moving up the ranks to supervisors and lieutenants. Many strangely told us “no comment” when we inquired about CPIR’s. We went to the Sheriff substation on Hwy 20 and I-94, and inquired at the communications office about CPIR’s, many were familiar with the reports but stated either no comment or suggested we talk to the reporting CPIR officers. We then drafted an open records request on December 20th. 2013, and delivered the request to the sheriff’s office. The request was simple and benign, seeking the criteria to qualify for reporting a “crime prevention incident”. How does one measure the value of these incidents if no criteria exist? In police science, methodology, criteria, controls, rules, rules of engagement and more are all used to measure and/or gauge the effectiveness of the actions of its force. In police work, the number of incidents that occur often reflects how busy an officer or department is. This wouldn’t be a story if CPIR’s were only filed a few times a year. But 20,233 times? this isn't a typo, twenty thousand, two hundred and thirty three times in 2013! That’s over 55 times a day a CPIR is filed by the Racine County Sheriff Department. So the story now begs a reason as to why the Racine County Sheriff Department personnel creates incident reports that have NO VALUE ? For the next 50 days we will be exploring, exposing and debating the value of CPIR’s. Fifty Shades of Grey ? Well, what started out as a simple and benign open records request to the Racine County Sheriff's Department became an investigation as to why the sheriff's department would not release any criteria about these incidents. while in office violated his oath of office, abused discretionary powers and filed a false affidavit into court records. Mike Nieskes failed to accept responsibility for his acts, omissions, poor judgment or criminal ways. Mike Nieskes never apologized for his errant and arrogant behavior. accepted responsibility of his temporary lapse of poor judgment, plead guilty and apologized to the world. Rich Chiapete also corrected many issues left behind from the former D.A. Mike Nieskes, including dismissing a case with prejudice that was in the corrupt Racine legal system for 20 months. These are among many glaring differences between former D.A. and Judge Mike Nieskes, and with our current Racine County D.A. Rich Chiapete. When one abuses their power, and another accepts their responsibility, the difference is clear, in character and integrity. Rich Chiapete has accepted responsibility in his error of judgment, is taking his hits and has stated so loud and clear. This is a sign of man who understands responsibility, and shows character. A temporary error in personal judgment is not the same as abusing ones power of their office. Art Howell's office intentionally released arrest video, and disseminated arrest facts to the public before trial. Art Howell also attempted to organize a meeting with all the Racine County police chiefs to “discuss the crisis” in order to further embarrass Mr. Chiapete. The attempted meeting was a bust. The majority of Racine County police chiefs refused to participate. Remember, you didn’t hear this “discuss the crisis” story from anyone else in the press. The Racine Journal Times once again withheld valuable information from the public and spewed its own political agenda on the front page and on the internet. Many area bloggers jumped on the story and unwittingly became the Racine Journal Times messengers. The Racine Journal Times never disclosed to the public the 100 plus page criminal complaint filed against Mike Nieskes to the State Attorney General’s office. The Racine Journal Times covered up the story to protect Mike Nieskes. I already know the Racine Journal Times will not learn any lessons from this incident, but how about Art Howell? Amber Gail Creek was a 14 year old girl who was murdered in 1997 and her body was left in marshland in western Racine County. This week the Racine County Sheriff Department announced the arrest of a suspect of Amber’s murder. Hopefully, closure can now begin for the family of Amber Gail Creek. The case remained unsolved for 17 years. The wheels of justice often turn painfully slow, but they still turn. With the tenacity and persistence of numerous law enforcement agencies, the agencies were finally able to put the pieces of the puzzle together by the use of fingerprint and DNA technologies. This tedious work lead to the identity and arrest of 36 year old James Eaton of Illinois. This arrest occurred because of the hard forensic work of investigators and the cooperation between numerous governmental agencies.